Le Jour Mondial De La Bulle 6 Mai, Une petite bulle pour un grand jour. 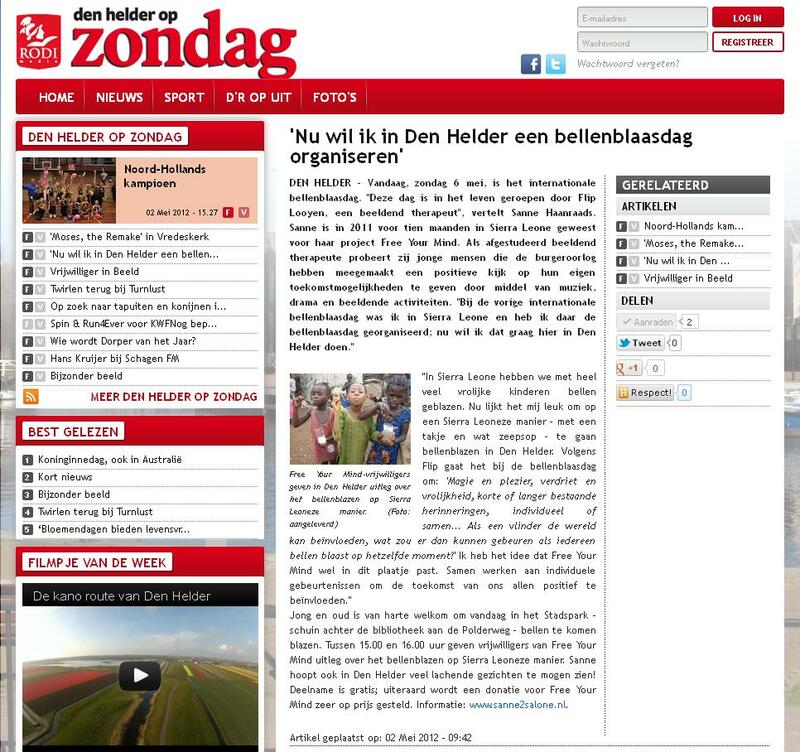 Sanne Haanraads had a interview bij the Sunday newspaper of Den Helder. She is organising a soap bubble activity in which one can experience how it was done last year in Sierra Leonne on May 6. Her motto: “Working together on individual events to make a positive influence for the future of us all”. 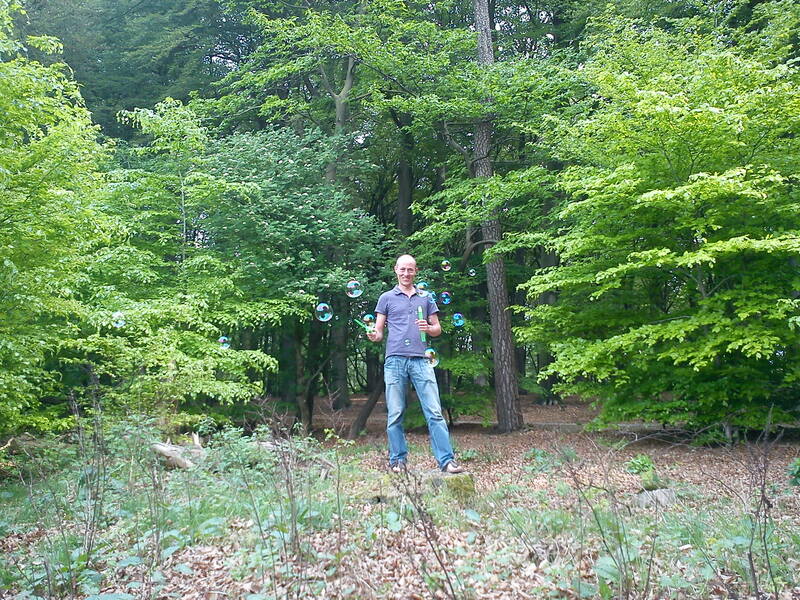 Pelle van Mansvelt was on friday May 6 in the woods of the Posbank, the National Park near Rheden, in the Netherlands. 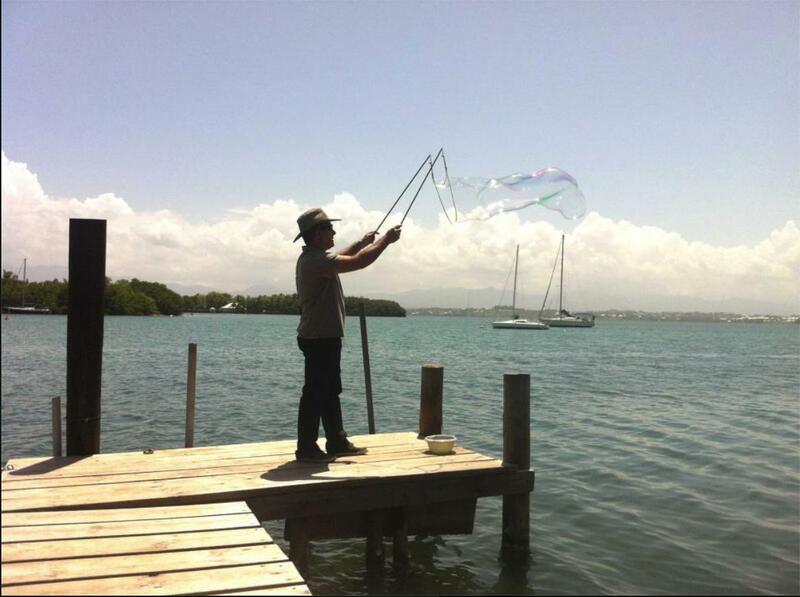 He titled the photograph: “Bubbles 4 the Bubbles”. You will have to understand Dutch and look for the timeline 49:32 between 06.00 and 07.00 to hear about the planned activity at the railway station in Eindhoven. Marlolijn Korteweg who was present with a friend at the closing ceremony of the International Blowing Bubbles Day in Lent wrote: “I send you the pictures that I took of the blowing soap bubbles ceremony. I have no censorship, so you can see for yourself what you want to keep. I thought it was a great initiative, repeating worthy”. The exhibition in Lent in “De Dorpsschuur” was photographed but mine were all to bad of quality for posting. Fortunately there were some pictures taken by others who did send them to me. On the first floor there was the mail art exposed and on the ground floor there were some paintings made by me and pictures out of the blog. There was also a small documentation about the preparations for the International Blowing Bubbles Day 2011. Here is the, already outdated, worldmap of the places and countries where people have been blowing bubbles (as far as I know of) on International Blowing Bubbles Day. In Lent we held on the breakwater of the river Waal a symbolic ceremony to mark the end the International Blowing Bubbles Day. The company walked with bubble solution and tools to the riverside. At the other side of the river there is the city of Nimeguen. Boats passed by and we all made bubbles that floated high and far allong the water. Fun, Joy, helping one another and realising that over the world people have been blowing bubbles in different ways and with different thoughts on there minds and still beeing part of one, shared experience. 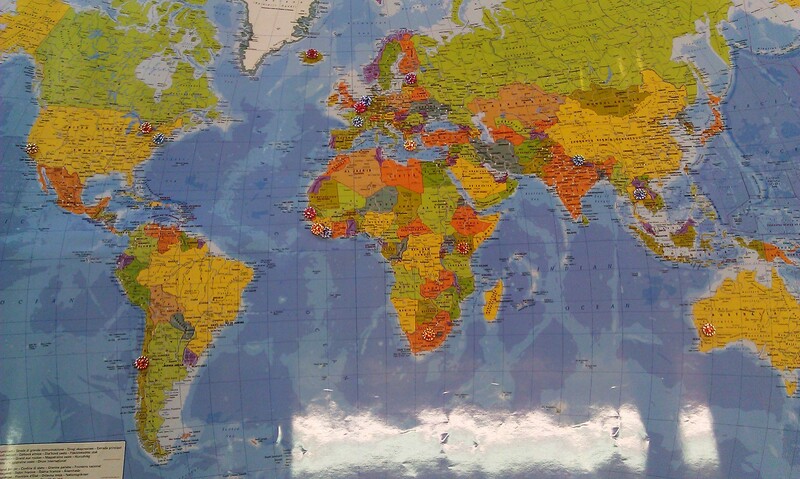 Touching scene for me, arranging this all and having met so many and wonderfull people across the world. Impression of the blowing bubbles session at the Academie voor Schone Kunsten, Arendonk in Belgium.